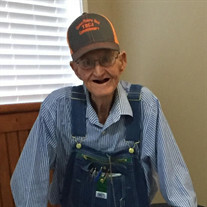 Jimmie Ray Gallemore, 88, of Houston, Texas, passed away on Monday, September 10, 2018. He was born on Monday, September 1, 1930 in Yoakum, Texas to Jack and Mittie (Bean) Gallemore, both of whom have preceded him in death. Jimmie was also preceded in death by his spouse of 66 years, Joyce Marie Gallemore; brothers, Earnest Gallemore, "Jackie Boy" Gallemore; sister, Juanita Pinkston; grandaughter, Holly Martin, son-in-law, John Beeson. Left to cherish his memory is his loving daughters, Barbara Ann Beeson, Paula Sue Gurka and husband Vince, Pam Deats; son, Kenneth (Sambo) Gallemore and wife Nancy; grandchildren, Kristie Howarth and husband Jimmy, Kevin Gallemore and wife Penny, Kelly Johnson and husband Owen, Theresa Easley and husband "T", Shane Gurka and wife Pam, Wesley Gallemore, Lindsay Gallemore; great-grandchildren, Tristan, Trace, Trip, Tressa, Tradyn, Natalie, Nathaniel, Nicholas, Sophia, Wyatt, Carlie, Hannah, Cooper, Callie, Griffin; along with numerous other loving family and treasured friends. Visitation for Jimmie will be held at Neal Funeral Home on Thursday, September 13, 2018, from 6:00 p.m. to 8:00 p.m. Funeral Services for Jimmie will be held at Neal Funeral Home on Friday, September 14, 2018, at 10:00 a.m. Interment for Jimmie will immediately follow at Dodge Cemetery FM 405, Dodge, Texas. Mike Thrash officiating. Lunch following at FBC Dodge.